I can't identify either's model (even with my spotter's guide, which only goes up to GP-20 era) It's a GP39-2 and a SW1500 (Thanks Don! ), but what I found extremely interesting was the switcher on the right. Granted I've seen plenty of switcher engines in my day, but never one in revenue service before. They were both gone by the time we got back. Let me reemphasize one thing: This is what I see across the street from my apartment. How awesome is that? Nothing covers the sounds of annoying upstairs neighbors better than a good heavy freight train. For those who want to know: These photos were taken from Olive Dr, across from the intersection of 2nd and L St in Davis, CA on October 11th, 2008 at 12:10 PM. 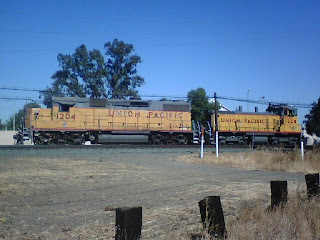 The switcher, UPY 1228, is a former Southern Pacific SW1500 built in 1974. 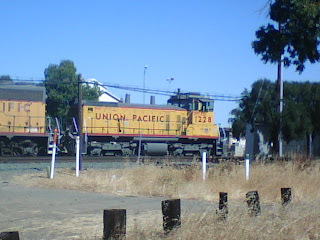 The other unit, UP 1204, is a former MKT GP39-2 built in 1977. UP 1204 is also interesting because it was built for Kennecott Copper for service in their Bingham Canyon copper mine in Utah, and had an extra high cab for visibility during loading by shovels in the mine.